SEAT showcases the new Tarraco in a new ad, that aims to inspire people to follow their passions and dreams, regardless of their age and against all odds, because age is just a number. The spot, part of the “Why Not Now?” campaign, follows a woman wearing a black wet suit as she’s walking on a frozen lake, in search of a spot to dive into the water. She makes a triangle-shaped hole in the ice (a reference to the sharp full LED headlights that retain the company’s triangular signature) and dives in. The commercial, which features a series of onscreen lines representing excuses for people not to embark on a such adventure, like “too wild,” “too tired,” “too far,” “too scary” and more, is set to the tune of “Try” by Bugge Wesseltoft & Sidsel Endresen, a song included on the 2002 album “Out Here. In There”. The advert ends with the onscreen lines “You don’t stop because you get older. You get older because you stop. The new SEAT Tarraco. Why not now?” and with the woman driving her Tarraco back to the city, on the snow-covered road. 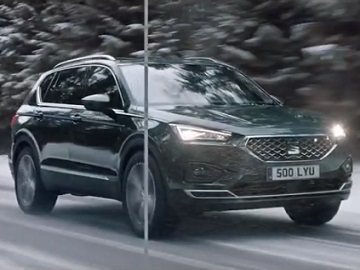 The long-anticipated 7-seat crossover from the Spanish automaker, named after the Mediterranean city of Tarragona, following the #SEATseekingName competition, boasts a sports design, 4Drive all-wheel drive system, four drive modes (Comfort, Eco, Sport and Individual) plus Off-Road and Snow for 4Drive versions. In terms of technology, it features LED headlights, digital cockpit, BeatsAudio, Media System or Satellite Navigation as standard, including an 8″ touchscreen display, DAB Digital radio, Bluetooth and Full Link. Among the available safety features are the Emergency Call, Traffic Jam & Lane Assist, Front Assist, and Pre-Crash & Rollover Assist.